Can Black Coffee Affect Your Cholesterol Levels? The French press, also referred to as a cafetiere, has been around since the 1850s. According to Galla Coffee, the exact origin of the French press is unknown as both the French and the Italians claim to have been the first to use it. 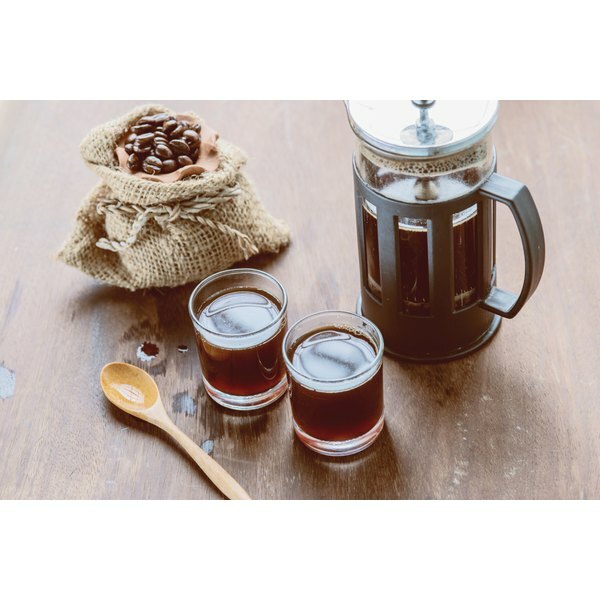 A French press allows the coffee grounds to soak in the hot water, helping to preserve the oils in the coffee, which results in a smooth, rich flavor. Black coffee made with a French press or with another coffeemaker will have similar nutrient profiles. A French press coffeemaker is a cylindrical container to hold boiling hot water. Boil water in a kettle or pot. Allow the hot water to warm the press for 30 seconds. Discard the water. Add coffee grounds. Once the boiled water has cooled for a couple of minutes, add it to the grounds. Put the lid and plunger in place. After the coffee infuses for 4 minutes, gently push the plunger down to hold the grounds while the coffee is being poured. Black coffee made from a French press contains 2 calories and no fat, cholesterol, sodium or sugar. However, this nutrition profile will change with the addition of sugar, creamer or other add-ins. Adding 2 tablespoons of 2 percent milk adds 16 calories to your beverage, and each teaspoon of sugar adds 15 calories. Minimize your sugar use if you drink coffee -- just a few cups a day and you'll easily exceed the 6- or 9-teaspoon intake limit for women and men, respectively. According to the International Coffee Organization, the amount of caffeine can vary between coffees. The blend, origin, method of brewing and strength of the brew affect caffeine levels. The average level of caffeine in a cup of coffee made with a percolator method, such as that used by the French press, is 80 milligrams. Coffee provides fluid, which is important for hydration. Black coffee is a low-calorie beverage, which may be helpful for people managing their weight. Unfiltered coffee -- the type made with a French press -- might also offer more benefits than filtered coffee, notes Harvard Medical School. Unfiltered coffee contains cafestol and kahweol -- two chemicals that boost liver health and might lower your risk of liver disease. The International Coffee Organization suggests that a moderate caffeine intake level is between 200 and 400 milligrams per day, which translates to around 3 to 4 cups of coffee. Caffeine increases alertness, can raise heart rate and increase blood pressure in some individuals. If you're sensitive to the effects of caffeine, you can still enjoy your coffee -- just switch to decaffeinated coffee grounds. You'll still reap the benefits of coffee's other phytochemicals. Harvard Health Letter: What is it About Coffee? Jessica Kovarik has been writing nutrition, healthy and physical fitness articles for three years. She is a registered, licensed dietitian. Kovarik specializes in sports nutrition, exercise physiology and medical nutritional therapy for heart health, celiac disease and diabetes. What Are the Benefits of Coffee for Weight Loss? Does Hot Chocolate Affect Diabetics?